Once again, after a live record had been released, Rush got down to some big changes in their sound. “Signals” would herald the beginning of the the band’s Synth Era, and they’d start including more keyboards, sequencers, and samples into their sound. Alex’s guitar would start taking a more secondary role, going more for a brighter, cleaner tone rather than the hard rock tone he had been known for up until this point (although he’d still get plenty of solos). And Neil’s lyrics would start to move away from science fiction, fantasy, and literature to more universal emotions and situations. A lot of fans have a lot of mixed feelings about Rush’s Synth Era, preferring previous eras when the band “rocked out” more. I can see why they feel that way, but personally? The Synth Era is my favorite era of the band. From here through “Counterparts”, Rush started producing some of their best and most consistent material, with the widest breadth of sound and emotional depth. And while the guitars don’t grind or distort very much, they still feature some of Alex’s most inventive and passionate playing. Adding more distortion in during recent live performances of songs from this era proved that. 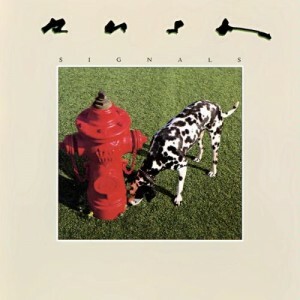 “Signals”, simultaneously, is an ending and a new beginning for Rush. The band had already started to move into this new direction (with Geddy composing more on keyboards than every before), but their long-time producer Terry Brown preferred their more progressive material. As such, this album is perhaps the closest to the sound of “Moving Pictures” out of all the synth era albums. “Moving Pictures” split pretty evenly between rock and new wave (particularly with “Vital Signs”), but on “Signals” the pendulum swung much more to the latter than the former. The album, fittingly, open with Geddy’s pounding keyboards on “Subdivisions”, literally the first herald of this new sound. In that respect, “Subdivisions” is one of Geddy’s best, sounding futuristic yet ethereal. Alienation of youth is a big lyrical theme on “Signals”, and Neil’s lyrics stand the test of time in terms of the melancholy of monotony and conformity the suburbs engender. If the band is to bring out one single song to best represent this era, I almost guarantee it’s “Subdivisions”. “The Analog Kid” shows Alex’s guitar isn’t down for the count though, bursting out of the gate with one of the band’s most high energy numbers. The theme of Analog vs Digital is a big one for “Signals”, the lyrics for this one telling the story of a young man who finds solace and quiet in the solitude of nature, yet longs for the adventure of the city. The verbosity and wordplay are some of Neil’s best, and why I often point to this era for some of his best work. Combine with Alex’s searing solo, this stands as one of my all-time favorite Rush tracks. Alex also gets a brief, blistering one during the intro during the beginning of “Chemistry”. The rest of the song belongs to Geddy though, with his heavy keyboards and one of his most distinctive basslines (I can’t tell you how many times my older brother and I did air bass to this song while driving in his car). My only criticism is that the lyrics aren’t some of the band’s best (having been contributed by all three members, the last time that would happen). Part of what I like about Rush’s sci-fi songs is how they come from a genuine interest and passion for the subject matter, and they reflect this by making their lyrics well thought-out and well-considered. The lyrics to “Chemistry” don’t really represent that though, feeling more like a collection of sci-fi buzzwords than an actual song. Still, I really enjoy this song in spite of that, but I admit compared to the rest of the tracks on the album its probably the weakest (though only by default). “Digital Man” is perhaps the closest the band ever got to ska, at least before Alex busts out another extended solo. The lyrics almost seem to pick up with the protagonist of “The Analog Kid” a few years later, where he’s achieved his dreams in the city but still yearns for something more, something fantastical. This song was ignored in live performances for many years, probably due to the loaded feelings the band had while recording it (but we’ll get to that). Still, it made a triumphant return on the “Snakes & Arrows Tour”, and is one of the tracks that best shows how hard the band’s Synth Period songs can rock. The opening synths of “The Weapon” bubble more under the surface than they do bound or soar like on the songs thus far. The second part of Neil’s “Fear” trilogy, this song shows more how fear can be used as a weapon against people, leading to the inevitable blind rage of mob mentality like in “Witch Hunt”. Alex leans heavy on the vibrato for this song, going for something more evocative than blistering. At this point, it feels like our “Digital Man” is coming face to face with the forces that hold him back, be it external factors or his own uncertainty. “New World Man” would be the album’s designated “last minute track”, but ironically it would come second only to “Subdivisions” in terms of popularity. Rush started dabbling a bit in reggae and ska in this era, with some people drawing comparisons to The Police. “New World Man” would be the song where the band would dive in head first into both genres. Alex doesn’t have a solo to speak of, but his echoing, chorusing guitars are undeniably the star of this song. The song’s lyrics somewhat giveaway its last minute nature, given how they directly quote previous songs on the album, particularly “Digital Man”. Still, it works here, perhaps showing that our “Digital Man” has evolved and grown from his fear, gaining a wider perspective. “Losing It” is the only song from the album to never be performed live, and I confess it’s a song that doesn’t come up on my Rush playlists very often. Not because it’s bad, oh no. Far from it. One of the saddest and most harrowing Rush songs, accompanied by mournful violin by Ben Mink (who would later produce Geddy Lee’s solo album), it describes a dancer’s slow death, wasting away from cancer. It almost feels like our New World Man is losing the “fawn-eyed girl with sun brown legs dancing on the edge of his dreams” from when he was a wee Analog Kid. A beautiful song, but so emotionally intense (especially given Neil Peart’s past tragedies) it’s hard for me to listen to very often. The album ends with “Countdown”, inspired by the band witnessing the launch of the space shuttle Columbia. The pounding synths and samples of the launch approved for use by NASA create an incredible image. Whereas “Cygnus X-1” blended sci-fi and fantasy to tell a great fable, “Countdown” shows more of the triumph of the real life human spirit and ingenuity when going into space. Perhaps emboldened by the loss of his fawn-eyed girl, our New World Man begins to take his title literally and reaches his only logical conclusion, heading off into the unknown to see what’s out there. 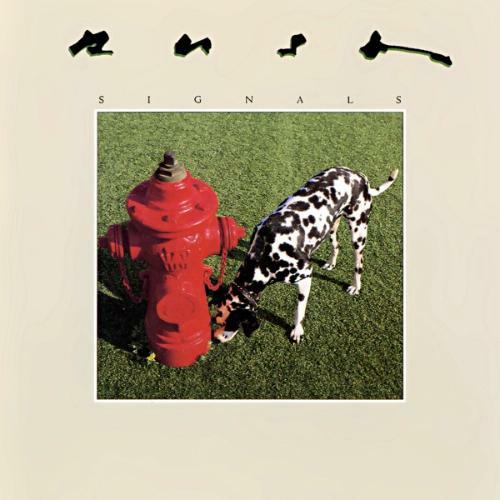 In the end, “Signals” was a great start to the band’s Synth Era, and while it’s not exactly a concept album, it has a stronger arc and themes to the songs than I had remembered, having not listened to them all in order for a while before writing this review. Sadly though, Rush’s new direction clashed with the wishes of their long-time producer Terry Brown, who had hoped the band would continue with the progressive rock he had played such a strong hand in making. After this album was released and the tour was completed, the band politely informed him they wanted to move on and work with other people. BEST SONG: “Subdivisions”, with “Analog Kid” as a close second for me.